Border Gateway Protocol (BGP) is quite different from other routing protocol. BGP is the Internet routing protocol and it is a slow routing protocol which is good for an Internet routing protocol. There are two kinds of BGP, which are Interior BGP and Exterior BGP. 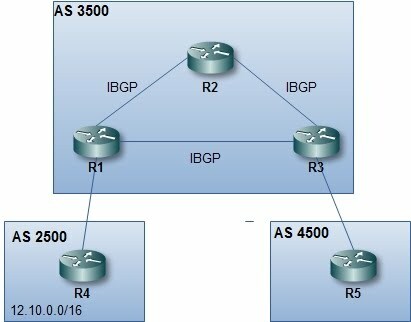 IBGP is when BGP is configured between routers within same Autonomous System (AS), while EBGP is when BGP is configured between routers in a different AS. EBGP behaves differently with IBGP. As we know that other Interior Gateway Routing Protocol such as RIP, OSPF or EIGRP will update the next hop address when advertising routes to its neighbor. IBGP doesn't do this. Neighbor in BGP should be configured manually. Another different concept in BGP is that neighbor in BGP shouldn't always be direct connected. In this topology bellow, R1 and R3 could be a neighbor without having a direct connection to each other. Instead of having a metric to determine the best path to a network, BGP uses a list of attribute. These attributes have an order of precedence, each attribute of the feasible routes will be evaluated in order and the best path will be chosen when there is an attribute that is better than the others. There are also two rules in IBGP, which are the synchronization rule and the split-horizon rule. You are not plannig to be a transit AS, that is having traffic from one AS to another AS over your AS. All of your router is running BGP. R1 receives the network 12.10.0.0/16 from R4, which then will advertise the network to R2 and R3. What if then R2 sends the network to R3 and vice-versa. In IGP such as EIGRP and OSPF, the routers could determine the best path to the network, but BGP couldn't. This is because BGP doesn't use the metric like bandwidth or delay to determine the best path, instead it uses some attributes which will not change over IBGP routers in the same AS. So, if R2 and R3 ever send the 12.10.0.0/16 network to each other, they will end up having two routes with the same attribute, and therefore could potentially create a loop in the network. In Cisco routers, you could turn off this rule if you're sure that no potential loop will be created. 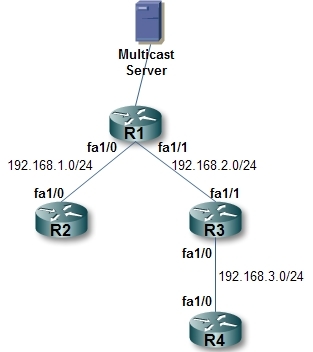 There are two modes that we can use in multicast routing. They are sparse mode and dense mode. The dense mode uses the source trees multicast routing technique which is more to broadcast and prune multicast traffic. The sparse mode uses the sharde trees technique, which uses a rendezvous-point to get multicast traffic. But there's another mode which is the sparse-dense mode which quite uses the combination of both modes. We will try to configure multicast routing in sparse-dense mode but we won't get into the detail of the theory of each mode. Let's say we have this topology. At the output of the command, you can see which interfaces are participating and in which mode. Then in any other router, try to ping the multicast address. Here, I use 239.1.1.1 as the multicast address that I joined in. If the router could reach the multicast address, you will see something like "Reply to request 0 from 192.168.2.1, 168 ms", but if the ping failed, you will see a ".". A.B.C.D: the ip address of the rp router. There are some other options to this command. Try putting the question mark and hit enter will list other options such as applying access list so that a specific rp only serves for a group of mutlicast address only. INTERFACE-TYPE INTERFACE-NUMBER: the type and number of the interface of which address will be used as the rp address. ex, serial0/1, lo1. NUMBER: the number of hops the announcement should traverse the network. It is a good idea to use loopback interface as the address of the rp since a physical interface could be down and it mark the rp as unreachable. So, use a loopback interface and advertise that loopback address by using your routing protocol, so the rest router in the network know how to reach it and do not forget to enable ip pim in the loopback interface. In this example, we will make R3 as the rp. Go to R3 and enter the following command "ip pim send-rp-announce loopback 0 scope 15". NUMBER: the number you want to reduce the multicast packet TTL. Every multicast packet has an TTL. With this command, you can reduce the TTL of multicast packets so it will not go any further beyond the interface where multicast packet is received. To be sure that you reduce the TTL to 0 (or even bellow it), just give the NUMBER parameter a big value such as 255.